A man who has unearthed an incredible haul of fossils from the ground of a city park, claims his finds put the quality of those from the Jurassic Coast to shame. Wildlife enthusiast Steve England says Bristol’s Stoke Park is so rich in fossils, it beats the Lyme Regis coastline hands down. He says the only place he has seen fossils of the same calibre is at the National History Museum in London. Mr England grew up in the Lockleaze area of Bristol on the fringes of Stoke Park and has been fascinated by the area’s natural history since he was a child. He now claims to have mapped Stoke Park’s history back millions of years, and says he believes the area was once a drowned desert. To prove this, Steve, dubbed the Ray Mears of Bristol, has unearthed “ammonites the size of dustbin lids” as well as fossilised palm leaves. He said: “It’s mind-blowing. The first place people think of when they think of fossils is Lyme Regis, but all they’ve got is marine fossils, we’re got marine and desert fossils right here in Bristol which are far better. 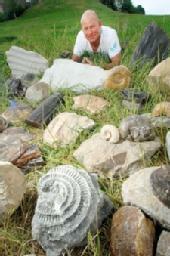 “I have several species of ammonites which were like massive sea snails, some of them are as big as dustbin lids. I have giant clams, hundreds of oyster shells, pebbles and even fossilised sea bed with the ripple marks in it — which is what you would see at the beach but this sea bed is 150 million years old. Steve’s incredible finds, coupled with years of online and other research have led him to conclude that Stoke Park and the Bristol area was once a balmy tropical paradise. A year later Steve has collected a whole fossilised palm tree leaf, a collection of palm tree stems and pieces of the bark of the trees. Now Steve wants to use his findings to help educate local children. This entry was posted in News and tagged fossils, history, Stoke Park. Bookmark the permalink.